We realize that not everyone can make it to Los Angeles for the 2017 Loudwire Music Awards ceremony. But we’ve got you covered if you still want to check it out. 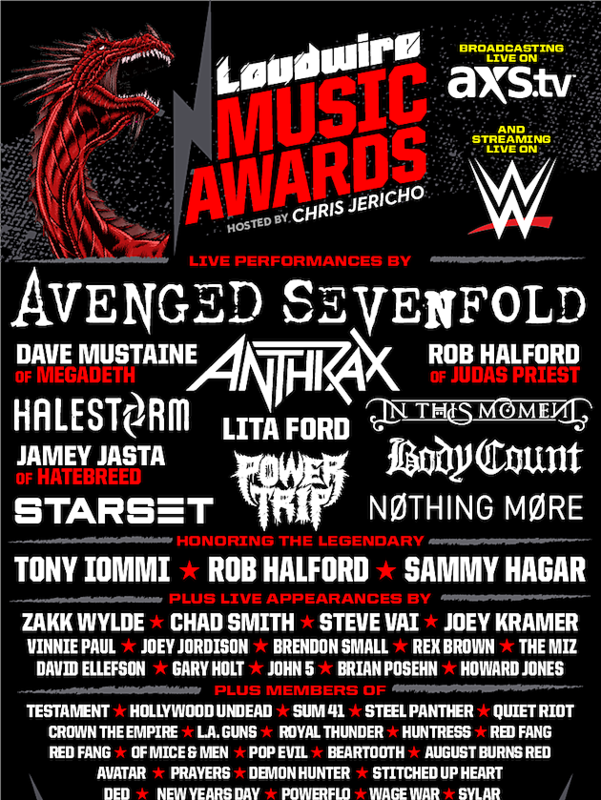 The Loudwire Music Awards have teamed up with AXS TV and the WWE to bring you the ceremony both on television and online. AXS TV will have the television broadcast starting at 7PM PT on Tuesday, Oct. 24. They will make sure you’re able to catch the award winners receiving their honors and all of the performances that will have you talking the next day. Meanwhile, the 2017 Loudwire Music Awards will simultaneously be live-streamed online via Loudwire’s Facebook page . And to more than 40 million fans through the WWE Facebook page, LMA host and WWE icon Chris Jericho’s Facebook page and fellow wrestling superstar The Miz’s Facebook page. As just stated, Chris Jericho will serve as the host for this year’s ceremony. It is taking place at the Novo in downtown Los Angeles. Jericho, who fronts Fozzy, is also a Loudwire Music Awards nominee this year as their song “Judas” is up for Hard Rock Song of the Year. This year’s ceremony will see Judas Priest’s Rob Halford receive the “Lemmy” Lifetime Achievement Award. Black Sabbath’s Tony Iommi will be honored with the Courage Award. And Sammy Hagar is set to be feted with the Humanitarian Award. In addition to these three honors, Loudwire’s readers had a chance to vote in all categories for hard rock and metal with the winners being revealed live at the ceremony. I am nominated for the Best Bassist award. The performance lineup is headed up by Avenged Sevenfold, with In This Moment, Anthrax, Halestorm, Body Count, Nothing More, Starset, Power Trip and special performances by Megadeth’s Dave Mustaine, Rob Halford and Hatebreed’s Jamey Jasta filling out the bill. Beside me there will be special appearances by Red Hot Chili Peppers’ Chad Smith, Aerosmith’s Joey Kramer and Lita Ford. Lineup also includes Hellyeah’s Vinnie Paul, Black Label Society’s Zakk Wylde, WWE superstar The Miz, Steve Vai, Steel Panther, Megadeth’s David Ellefson, Vimic’s Joey Jordison, Rob Zombie guitarist John 5 and Hollywood Undead. Tickets for the 2017 Loudwire Music Awards are currently available here for those that plan on being in the Los Angeles area on Oct. 24. In addition to the Loudwire Music Awards, there will be a series of panels prior to the event as part of the Hard Rock and Heavy Metal Summit right next door at the Grammy Museum. Join me and other panelists (Rob Halford, Sammy Hagar, Steve Vai, Frank Bello and more) as we discuss the past, present and future of heavy metal. The event is free and on a first-come, first-served basis, but you will need to register to participate at this location.